It all started with this question Keith Clark recently asked on twitter. CSS repeating-linear-gradients, do we need these? Can't the same thing be achieved with a linear-gradient and background-size? Their cousin, repeating radial gradients, definitely come in handy. 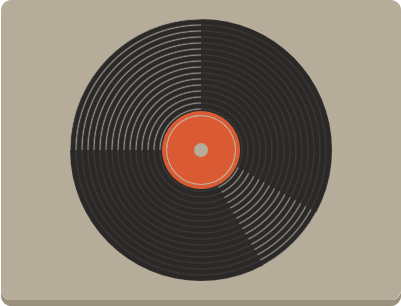 They have saved me from having to write tens of stops inside a regular radial-gradient when I wanted to reproduce the look of a vinyl record with CSS. Until this year, I was also convinced they're useless. But in early February, while working on a canvas demo, I fell into the trap of styling the control panel for that demo and ended up reproducing over 100 slider designs I found online, each with the (self-imposed) restriction that I should use just one range input per slider. Warning: while I did learn a lot creating them, I never went back to apply what I learned along the way to the sliders I had already coded, so, with the exception of the last few, I wouldn't really recommend them as a good resource. Also: if I never have to style another range input again, it will be too soon. Some of these styled range inputs had striped fills or rulers, so they required using gradients, particularly repeating linear gradients, quite a bit. I used repeating linear gradients precisely because it turned out normal linear gradients were not enough. Let's see why! See the Pen simple repeating-linear-gradient pattern by Ana Tudor (@thebabydino) on CodePen. See the Pen simple linear-gradient pattern - step 1 by Ana Tudor (@thebabydino) on CodePen. What if we put the .25em wide black stripe in the middle? Let's try that! It's a little closer now, but it still doesn't look good. See the Pen simple linear-gradient pattern - step 2 by Ana Tudor (@thebabydino) on CodePen. If we zoom in, it becomes more obvious what the problem is and what we need to do about it. We have to fill out those corners with black. This means adding a small black stripe at the beginning of the gradient line and one at the end. Each of these will be half the width of the initial black stripe in the middle (so half of .25em, which is .125em). See the Pen simple linear-gradient pattern - step 3 by Ana Tudor (@thebabydino) on CodePen. See the Pen simple linear-gradient pattern - step 4 by Ana Tudor (@thebabydino) on CodePen. Perfect! It's visually the same result as in the repeating-linear-gradient version. But in this case, it's too much work, too many computations, too much code, too much risk for rounding errors (the demo above will break if we set the font-size to some weird value like 1.734em which doesn't compute to an integer pixel value). And in case you're not yet convinced that repeating-linear-gradient is the better solution in this case, let's imagine the gradient angle isn't 135°, but something different... let's say 120°. Using repeating-linear-gradient, the code is almost the same as before, we only need to replace 135deg with 120deg. See the Pen simple repeating-linear-gradient pattern v2 by Ana Tudor (@thebabydino) on CodePen. All seems fine in Firefox and Edge/IE, but the transition from blue to black doesn't look good in Chrome. We can fix that by not making the transition sharp, leaving a 1px distance in between. See the Pen simple repeating-linear-gradient pattern v2 (Chrome fix) by Ana Tudor (@thebabydino) on CodePen. With plain old linear-gradient, we also need to change the angle from 135deg to 120deg. But it's not enough this time. See the Pen simple linear-gradient pattern v2 - step 1 by Ana Tudor (@thebabydino) on CodePen. We also need to change the dimensions of the background-size, as this is not a square anymore. The x dimension will be 1.5em*abs(cos(120deg)), while the y dimension will be 1.5em*abs(sin(120deg)). See the Pen simple linear-gradient pattern v2 - step 2 by Ana Tudor (@thebabydino) on CodePen. Again, the edges don't look good in Chrome, so we need to use the 1px spacing trick. See the Pen simple linear-gradient pattern v2 (Chrome fix) by Ana Tudor (@thebabydino) on CodePen. The linear-gradient alternative isn't pretty, but it exists. Is there something repeating-linear-gradient can do that plain linear-gradient and the proper background-size can't do at all? 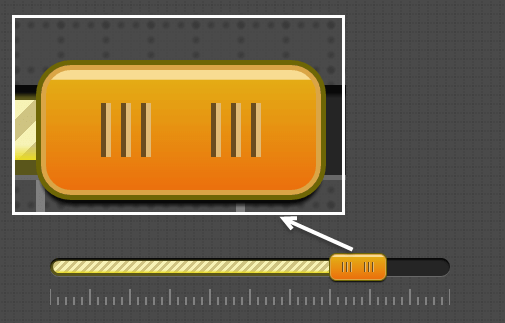 If you've paid attention to the slider examples shown at the beginning, the striped gradient reproduced above is used to fill the slider track before the thumb (on the left of the thumb). IE and Firefox have dedicated pseudo-elements for this (-ms-fill-lower and -moz-progress respectively) and all we need to do is add the background created earlier on these pseudos. But for WebKit browsers, the only way to get that striped fill is to add another background on top of the regular one used for the slider track and then update how much of the track it covers as the slider thumb gets adjusted. Now this creates a big problem with the plain linear-gradient. We cannot control how much of the track it covers via background-size because we are already using background-size to create the striped look. In addition to that, gradients either repeat indefinitely or they don't repeat at all. It would probably be cool if we could specify number values for background-repeat in the same way we can for animation-iteration-count. Something like background-repeat: .5 1.5 would make half of the background to be displayed horizontally and have one tile and a half displayed vertically. But we cannot do this. Maybe we have some other way of making a linear-gradient repeat just within certain limits? Well, the only way we could create something that gets close to what we want with plain old linear-gradient and background-size is to stack up identical gradients and position them one after the other while not allowing them to repeat in at least one direction. But this only works for changing how much of the track the striped part covers in increments of $size-x, it's useless if we want finer control. Plus, it's really ugly to stack up maybe 20 identical gradients. See the Pen constrain a linear-gradient within certain limits by Ana Tudor (@thebabydino) on CodePen. In short, my advice is: don't do this! The code is horrible and breakable, we could easily end up with gaps between the gradients for certain background sizes or on zoom. See the Pen constrain a repeating-linear-gradient within certain limits by Ana Tudor (@thebabydino) on CodePen. 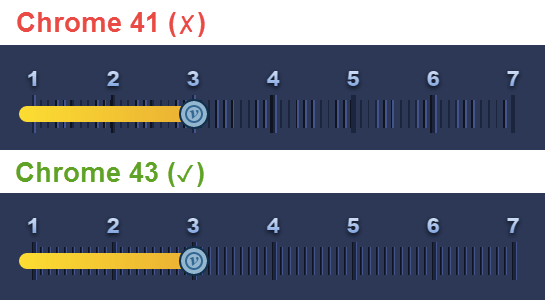 This is how I was able to control how much of the slider track was filled with the striped gradient every time the slider thumb value got updated - by changing the x component of the background-size. See the Pen simple ruler not covering the entire element by Ana Tudor (@thebabydino) on CodePen. See the Pen ruler not covering the entire element #2 by Ana Tudor (@thebabydino) on CodePen. This is exactly the kind of ruler that was used in one of the examples at the beginning. See the Pen ruler not covering the entire element #3 by Ana Tudor (@thebabydino) on CodePen. The slider thumb grips in the following example were created in exactly the same manner. There are two identical repeating linear gradients, both limited horizontally to twice the size of the repeating part plus the width of the non-transparent part. Horizontally, the first one is positioned at 25% and the second one at 75%. 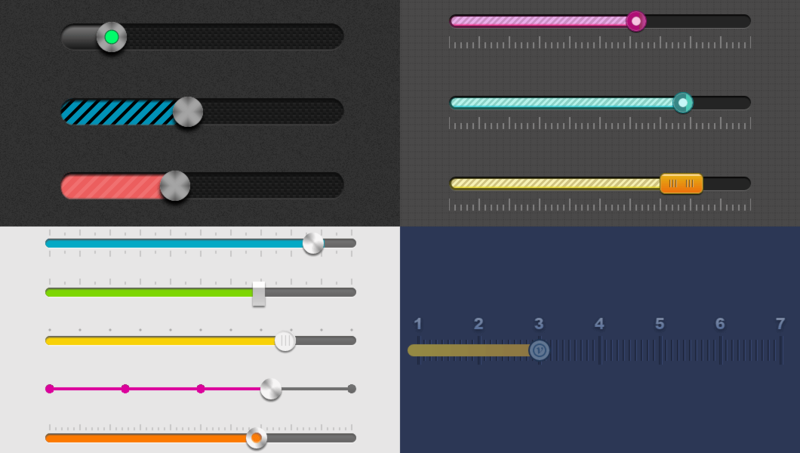 See the Pen thumb grips by Ana Tudor (@thebabydino) on CodePen. Repeating gradients used to be a real headache and we can still run into issues with thin gradient lines, especially when they cover larger areas. They won't always have the same width in WebKit browsers and Firefox on OS X isn't very precise when rendering them (though Firefox on Windows rarely ever fails here). But things have improved a lot and I believe they'll continue to improve. Even as I was creating those sliders at the beginning of this year, I could see pretty big differences between what were then the stable (41) and the canary (43) versions of Chrome. Repeating gradients are a lot safer to use now and I think they deserve a bit more love because they can make our lives much easier and that makes them pretty cool in my eyes. See the Pen Harry Potter by Richard Vyslouzil (@remeritus) on CodePen. Is there any fix for the thin diagonal lines issues on FF for OS and Safari? I’m running into these very issues on a project and I really don’t want to solve it by using images (if I can help it). 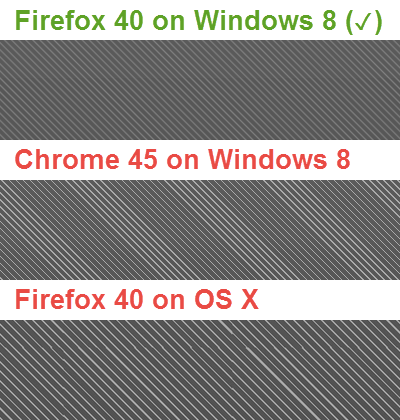 Blurring the lines with the 1px difference trick fixed the problem for me in Chrome/ Opera on Windows (live test), but I personally haven’t tested on OS X – update: it appears like it doesn’t fix the issue for Firefox on OS X and Safari. If this method doesn’t work, SVG would be a lightweight and maintainable solution. And of course, keeping on pestering implementors for the future. Things can and they do change for the better. @AnaTudor Where do we pester them at? Can you share a URL? I would like to pester them about adding rounded outlines! Excellent write-up, Ana – thanks!